Things get to be standard for a reason. — Latvian Proverb. If you own one of the many popular drinking water systems that use uniquely sized replacement filters–Aquasana, Brita, and Pur, for example–the total number of replacement cartridges you have to choose from are one. That’s because the manufacturer has made the filter so that it will accept only one cartridge size–the size that the manufacturer alone makes. This system is known in the industry as proprietary sizing. The purpose is to assure the maker that you can buy only his cartridges. It also relieves the maker of the need to provide variety. One-size-only normally also means one-style-only. Whether your water is disinfected with chloramines, chlorine, or nothing at all, you get the same filter cartridge. If your water has lead or no lead, fluoride or no fluoride, it’s the same cartridge. If, on the other hand, you own a drinking water system that uses a standard 9.75″ X 2.5″ filter cartridge, you can choose from literally dozens of different cartridge styles, and you can even buy a cartridge from a manufacturer other than the one who made the filtration system. This size, which we call Size 1 for convenience, is the most commonly made filter size. Almost anyone who makes water filters makes some cartridges in this size. Below are some examples of standard-sized cartridges that will fit all standard-sized filtration units, countertop filters, undersink filters, reverse osmosis units, add-on filters, and even garden hose filters. Standard cartridges come in two general style–radial and axial. These can be interchanged. In other words, if you purchase a water filter with a standard sized axial cartridge, you can replace it with a radial cartridge. The pictures below will explain. The ChlorPlus 10 cartridge made by Pentek fits any standard housing. 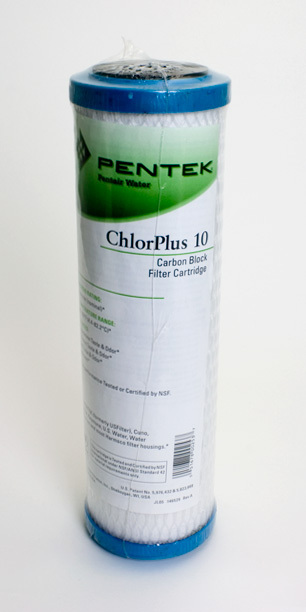 An excellent all-around carbon block, it is designed to be especially good a chloramine reduction. It fits countertop filters, undersink filters, and reverse osmosis units. The standard filter shown above is a “radial style” cartridge. This means that water to be filtered passes through the outside wall of the filter cartridge and works its way into the core. The cartridge, therefore, has a very large filtering surface. Above is an “axial” style media cartridge. It contains calcite, a sacrificial medium that raises pH and adds minerals to low pH water, plus coconut shell carbon for taste/odor and chemical treatment. 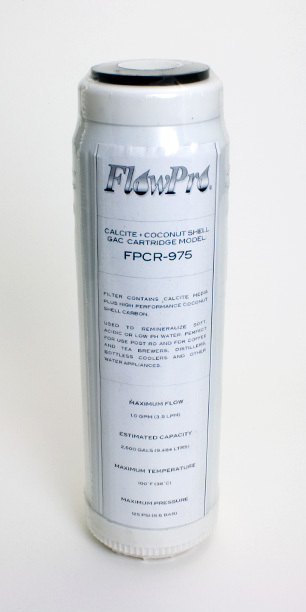 Its most common application is as a reverse osmosis postfilter. There are also many “axial style” cartridges that fit in standard housings as well. These interchange with radial filters and no modification of the housing is needed. Axials work differently. Rather than flowing through the side of the cartridge to the center, with axials water enters one end of the cartridge and flows the entire length of the cartridge to exit the other end. Cartridges of this type are often called “media” cartridges, since they use granular filter media. Most specialty cartridges (fluoride, nitrates, arsenic, etc.) fall in this category. Granular carbon cartridges as well are almost always axials.